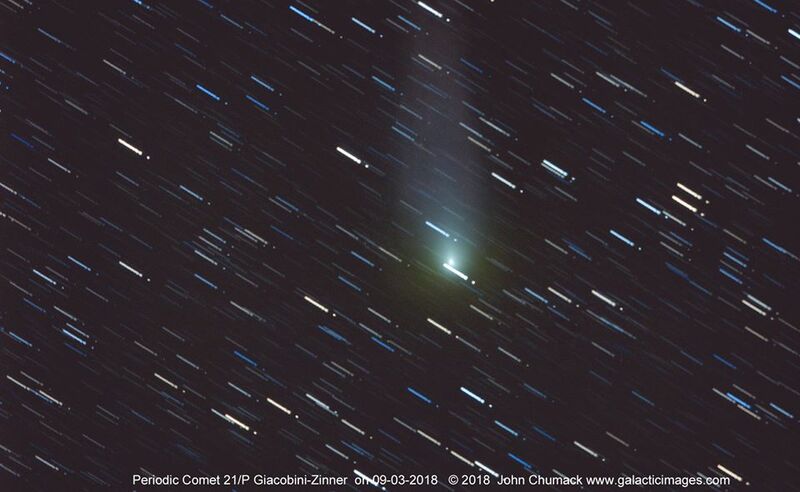 Here is my color image of the Comet 21/P Giacobini-Zinner taken through my homemade 16 inch Diameter Fork Mounted Newtonian telescope & my old QHY8 Cooled color CCD camera. Captured on 09-03-2018 from 08:19 to 08:43 U.T. 26 x 30 sec subs.,stacked on the Comet's Nucleus, from my Observatory at JBSPO in Yellow Springs, Ohio. You can see the color difference between inner & outer green coma, as well as the blue trailing into the dusty reddish tail further back.